The past few days my internet has been turning on and off intermittently . Mostly it's off and I might get 10 mins of internet where I can check email. I'm trying to sneak in a fast one before it goes out again, this is Steel Wheeling by Maybelline Colorama. I'm wearing 1 coat of China Glaze Millennium and 2 coats of Steel Wheeling on top of it. This was pretty sheer and the layering was necessary. It has just the right amount of holographic glitter it makes your eye stay for a second longer lol. Found this and a bunch of others at the Dollar Tree in the 3 packs so I'll have more to show you soon. Totally jealous, haven't seen a single Colorama yet, but I keep looking because I have been hearing this is being found at DTs! Super pretty over Millenium! By the way, I hit up Michael's today and they had "melmers" on sale again, so I did buy two more! So glad I saw your post. That is so pretty! I have never heard of this brand before. Love this manicure. I never get much at the Dollar Stores. They always have pinks and they're always the same shades. OMG, I actually *remember* this color from when I had quite a bit of polish! This was one of my favorites, although for me it seemed a bit more charcoal than anything else. 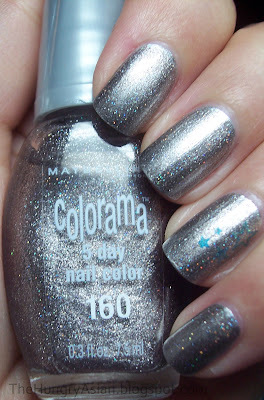 I seriously wish Maybelline hadn't discontinued the Colorama's. They were such awesome colors and combinations you could do with them and it seemed like they came out with new ones every year or less. Anyway, *love* on you. And the idea of layering it over Millennium -- I've been taking to the idea of layering quite a bit lately.